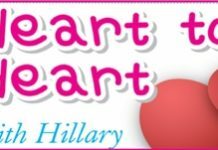 Home Blogs Heart to Heart with Hillary Johnny to the rescue! Why do some of your readers want to pick a fight with you? You are doing your best and if they don’t like your advice they start complaining. Don’t these people know this is an entertainment page? Even so, your advice is pretty well on the mark. Aren’t you just the sweetest man. But, Petal, I don’t let silly people worry me, especially when I know there are readers out there who understand what this column is about. These are readers with real problems, looking for confidential advice. Thank you for your support. Previous articleForgive or take a walk?